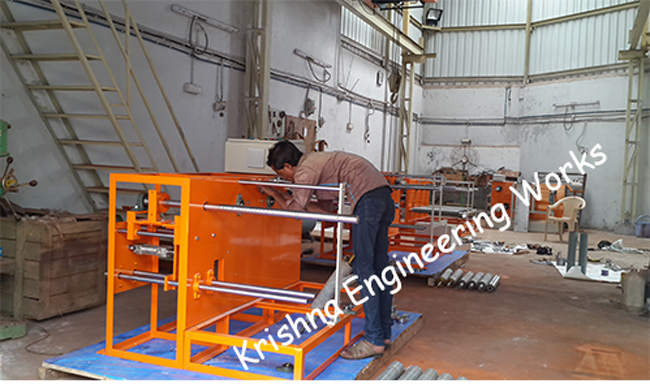 Krishna Engineering Works are successful manufacturers, exporters & suppliers of above machineries with great performance & quality assurance with customer satisfaction. We confirm the assurance of the quality of machineries and its components as they are being manufactured in our own factory, which is well equipped with all necessary top quality technically skilled personnel, raw materials & machineries. From raw materials to finished components are carried out up to final stage of assembly with total inspection to ensure export quality. Also in the final stage of the machine, continuous trial is taken to satisfy ourselves before being dispatched to our customers. We use state of the Art Technology with computerized drawing designs. Our Vision for future is our today’s hard work & customer satisfaction over and over again. With 12 service personnel in the field ensure promptly servicing & installation. Though we ensure that our Slitter Rewinder Machine for Paper, Plastic Film, Flexible Packaging, PVC, etc. and web guiding system for Coil Rewinding & Winding Machine for Batch Printing along with Web Aligner System & Web Guiding System runs smoothly without any maintenance for at least 10 years, our service engineer can reach within 24 hours of your Service Call. We have been successfully Manufacturing, Exporting & Supplying all types of Web Guiding System , Tracking Roller Assembly and Web Aligner System since last 25 years from Ahmedabad, Gujarat, India. We are winner of 3 times National Award and 2 times International Award for Quality manufacturing. KEW Manufacturers, exports & supplies web guiding system with high production output & efficient edge guiding function with more than 4000 installation in place all over India and overseas like Gulf Countries, Saudi Arabia, UAE, Dubai, Sharjah, South Africa, Nigeria, Ghana, Congo, Kenya, Zambia, Sri Lanka, Bangladesh, Malaysia, Pakistan, Nepal, Russia, Thailand, Indonesia, Brazil, Colombia, Venezuela, Argentina, Mexico, Canada, America, etc. making us the biggest manufacturer, exporter & supplier of web guiding system. Doctoring Rewinding Machine can also be used as Winder Rewinder for Inkjet or Batch Coding application. Our web guiding system is used for all types of Laminates like, Foil, Paper, LDPE, HDPE, PVC, etc. Our web guiding system is manufactured with us most precision which ensure zero maintenance up to 10 years. Our Winder Rewinder Machines for Inkjet Printing & Batch Printing are widely used by all Printer Manufacturers all over the world. Our Winding Rewinding Machines give efficient prompt printing an all types of laminates like, Foil, Paper, LDPE, HDPE, PVC, etc. The Batch Coding application for Winder Rewinder Machine is coupled beautifully & synchronized well.